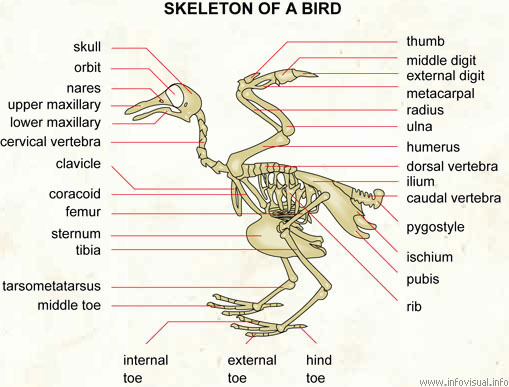 Skeleton of a bird - Visual Dictionary - Copyright © 2005-2016 - All rights reserved. [img]https://infovisual.info//storage/app/media/02/img_en/056 Skeleton of a bird.jpg[/img] [url=https://infovisual.info/en][/url] - [url=http://www.infovisual.info/]Visual Dictionary[/url] - Copyright © 2005-2016 - All rights reserved. Skeleton of a bird: a warm-blooded animal with two wings, two feet, a horny beak and a body covered with feathers. Middle digit: jointed middle appendage. External digit: jointed outer appendage. Metacarpal: bone forming the wrist. Radius: inner bone of the forearm. Ulna: outer bone of the forearm. Ilium: bone of the pelvis. Pygostyle: piece formed by the fusion of the last vertebrae of the tail. Ishium: bone of the pelvis. Pubis: bone of the pelvis. Rib: bone of the thoracic cage. Hind toe: jointed rear appendage. External toe: jointed outer appendage. Internal toe: jointed inner appendage. Middle toe: jointed middle appendage. Tarsometatarsus: bone of the lower leg. Tibia: bone forming the central part of the leg. Sternum: central crest of a bird's sternum. Femur: bone of the first part of a bird's leg. Coracoid: projecting part of the shoulderblade. Cervical vertebra: bone of the neck. Lower maxillary: lower part of the beak. Upper maxillary: upper part of the beak. Nares: chamber of the nose. Orbit: cavfity of the skull that contains the eye. Skull: bony case of the brain. Adult falcons have thin tapered wings, which enable them to fly at high speed and to change direction rapidly. Fledgling falcons, in their first year of flying, have longer flight feathers which makes their configuration more like that of a general-purpose bird such as a broadwing. This is to make it easier for them to fly while learning the exceptional skills required to be effective hunters in their adult configuration. A falcon's wings are shaped like a scythe. Although common misconceptions of the difference of a scythe and sickle are the cause of the misconception of the shape of the falcons wings. Peregrine Falcons are the fastest-moving creatures on Earth. Other falcons include the Gyrfalcon, Lanner Falcon, and the Merlin. Some small insectivorous falcons with long narrow wings are called hobbies, and some which hover while hunting for small rodents are called kestrels. The falcons are part of the family Falconidae, which also includes the caracaras, Laughing Falcon, forest falcons, and falconets.